A number of chemicals, including several organochlorine pesticides, have been identified as persistent organic pollutants (POPs). Here, the properties of chlorpyrifos (CPY; CAS No. 2921-88-2) and its active metabolite, chlorpyrifos oxon (CPYO; CAS No. 5598-15-2), are assessed relative to criteria for classification of compounds as persistent, bioaccumulative, and toxic substances (PBTs). The manufacture and use of POPs are regulated at the global level by the Stockholm Convention (SC) and the UN-ECE POP Protocol. Properties that result in a chemical being classified as a POP, along with long-range transport (LRT), while understood in a generic way, often vary among jurisdictions. Under the SC, POPs are identified by a combination of bulk (intensive) properties, including persistence and biomagnification, and an extensive property, hazard. While it is known that CPY is inherently hazardous, what is important is the aggregate potential for exposure in various environmental matrices. Instead of classifying chemicals as PBT based solely on a few simple, numeric criteria, it is suggested that an overall weight of evidence (WoE) approach, which can also consider the unique properties of the substance, be applied. While CPY and its transformation products are not currently being evaluated as POPs under the SC, CPY is widely used globally and some have suggested that its properties should be evaluated in the context of the SC, especially in locations remote from application. In Europe, all pesticides are being evaluated for properties that contribute to persistence, bioaccumulation, and toxicity under the aegis of EC Regulation No. 1107/2009: 'Concerning the Placing of Plant Protection Products on the Market.' The properties that contribute to the P, LRT, B, and T of CPY were reviewed, and a WoE approach that included an evaluation of the strength of the evidence and the relevance of the data to the classification of CPY and CPYO as POPs or PBTs was applied. While toxic under the simple classification system used in EC Regulation No. 1107/2009, based on its intensive properties and results of monitoring and simulation modeling, it was concluded that there is no justification for classifying CPY or its metabolite, CPYO, as a POP or PBT. A number of chemicals, including several organochlorine pesticides, have been identified as persistent organic pollutants (POPs). The POPs were first brought to the attention of the general public by Rachel Carson in her book Silent Spring. In that now famous book, she pointed out that a number of chemicals, including the pesticide dichlorodiphenyltrichloroethane (DDT) and its transformation products, dichlorodiphenyldichloroethylene (DDE) and dichlorodiphenyldichloroethane (DDD), were not only persistent but also biomagnified in food chains, caused adverse effects in non-target organisms, such as birds, and underwent long-range transport (LRT) to more remote and pristine areas, such as the Arctic and Antarctic. At about the same time, it was recognized that a number of other organochlorine pesticides and the industrial chemical polychlorinated biphenyls (PCBs) also had properties consistent with them being POPs. Since that time, these and additional chemicals have been identified as POPs and the manufacture and use of these substances are regulated at the global level by the Stockholm Convention (SC)  and the UN-ECE POP Protocol . While many of the chemicals classified as POPs have been organochlorines, some such as those that contain the terminal degradation product, perfluorooctanesulfonate (PFOS) are not. As in many regulatory systems, the SC uses the precautionary approach; however, this includes detailed scientific review by the POPs Review Committee, where there is an opportunity to consider the inherent properties of the chemical under review. While understood in a generic way, the properties that are used to derive criteria for classification of a chemical as a POP with LRT, or a PBT, are used differently among jurisdictions ,. Under the global aegis of the SC, POPs are identified by a combination of intensive properties (independent of concentration), including persistence, biomagnification, and chemical and physical properties that result in harmful interactions with biological systems, and extensive properties (dependent on concentration), including toxicity, hazard, and risk. In addition to the SC , several additional frameworks have been developed to assess chemicals based on the properties of persistence, bioaccumulation, and toxicity (P, B, and T). Some of these frameworks are international, such as the Convention for the Protection of the Marine Environment of the North-East Atlantic . Others are regional, such as the EU legislation Registration, Evaluation, Authorisation and Restriction of Chemicals (REACH ), with a focus on chemicals in commerce, and EC Regulation No. 1107/2009 , which is focused on pesticides. National frameworks include, for example, the Toxic Substances Management Policy , the Toxics Release Inventory Reporting , and the Chemicals Management Plan in Canada . Classifying chemicals as POPs or having the properties of PBTs is used to assist industries in making decisions about the development of chemicals and governments in priority setting and regulation of these chemicals. The concepts of persistence, bioaccumulation, and toxicity are commonly used in the scientific literature, as is the internationally used concept of a POP. PBT, as a term, appears to have originated in policies of the Japanese government in the 1970s, even though the term did not appear in the peer-reviewed scientific literature until the 1990s . This term and underlying concepts are being used increasingly by policy makers in regulatory decisions. Unfortunately, inconsistent definitions and criteria for classifying chemicals as being PBT vary among jurisdictions and have been changing over time. Furthermore, this very simplistic method of classification does not take into account the unique properties of chemicals or the environments to which they are released . These shortcomings are exacerbated by both poor quality of data and, in some cases, little or a complete lack of data, such as was the case for perfluoroundecanoic acid . There are a number of uncertainties in these approaches that require interpretation of metrics such as persistence in various media, bioaccumulation, and toxicity. Since everything can be toxic, the critical issue is not the inherent toxicological properties of a chemical, which is its potency, but the concentration to which it can accumulate into various matrices of the environment. Ultimately, interpretation of the potential for harm that can be caused by a chemical of concern (COC) is duration and intensity of exposure that determines the severity and rate of damage. Injury occurs when the rate of damage exceeds the rate of elimination and/or repair. So the concept of toxicity needs to be considered not in abstract or absolute terms, but relative to exposures. Of the three principal parameters used to classify chemicals, toxicity is the least well described and interpretable. Adverse effects are only observable when the concentration (exposure) of a substance exceeds the threshold for effects for a sufficient duration. Because of its intensive properties, a chemical, such as the organophosphorus pesticide chlorpyrifos (CPY), can have relatively great potency to cause adverse effects, but if the concentrations in various matrices do not exceed thresholds for adverse effects, there is no adverse effect. Risk is defined as the likelihood for exceedence of a threshold (used here in the inclusive sense) and is always expressed as a probability. This has been known for some time, as attributed to Antoine Arnauld in a monastic text in 1662: 'If, therefore, the fear of an evil ought to be proportionate, not only to its magnitude, but also to its probability…' (page 368 in ). Several properties drive the probability of exposure but the most important parameter is persistence. If a COC is sufficiently persistent, then there is always the potential for accumulation and toxicity. Even if a compound degrades relatively rapidly, if it is released continuously or organisms are exposed for a sufficient duration, it might be present in sufficient quantities to exert toxicity. Such substances have been termed ‘pseudo persistent.’ So here the classification of CPY as a POP is considered not only relative to specific, absolute ‘trigger’ values for the classifying parameters but also relative to what is likely to occur in the environment. That is, while it is known that CPY is inherently hazardous, what is the aggregate potential for exposure in various environmental matrices ,? Instead of classifying chemicals as PBT based solely on a few simple, numeric criteria, a transparent weight of evidence (WoE ) approach, which can also consider the unique properties of COCs, should be applied ,. This approach allows all relevant scientific data to be considered on a case-by-case basis, but the process of classification requires more description of the process and expert evaluation of the results of the multiple lines of evidence. While CPY and its transformation products are not currently being formally evaluated as POPs under the SC, it has undergone simplified screening as an alternative to endosulfan. This screening suggested that CPY might meet all Annex D criteria (be a POP) but there are only equivocal or insufficient data . CPY is widely used globally and some have suggested that its properties should be evaluated in the context of POPs . In Europe, all pesticides (excluding biocides used to control bacteria and fungi) are being evaluated for properties that contribute to persistence, bioaccumulation, and toxicity (PBT) under the aegis of EC Regulation No. 1107/2009: ‘Concerning the Placing of Plant Protection Products on the Market’ . Under EC Regulation No. 1107/2009, products identified as POPs under the SC are not allowed to be used. Properties that contribute to P, LRT, B, and T of CPY have recently been reviewed ,. These reports were part of a series devoted to assessing risks to environments associated with the use of CPY in the United States of America (USA). This report builds on these previous reports but refines the assessment with a WoE approach that includes an evaluation of the strength of evidence and relevance of the data to classification of CPY as a POP or PBT. There is general recognition that industry has a responsibility to evaluate its commercial products, especially chemicals such as pesticides, for their possible environmental impacts. One approach for doing this is to use POP and PBT criteria as a basis for quantitative evaluation of properties, even when there is little likelihood that the chemical will be considered or declared to meet these criteria. In short, established POPs and PBTs are used as ‘benchmarks’ against which the chemical in question can be compared. It is partly in this spirit that this evaluation was undertaken. Chemicals can be assessed and classified as PBTs under several auspices with varying sets of guidelines. While there is some guidance on how the classification should be done , none of these processes are inherently assessments of risk. That is, they do not consider probabilities of exceeding threshold concentrations for defined effects in the environment. At best, these processes are an evaluation of measured or predicted parameters that relate to persistence in various media and the potential to bioconcentrate or biomagnify. Since there were no predefined criteria for identification of POPs, they have been developed over time by various individuals and/organizations from empirical observations of a number of chemicals that were observed to be persistent, biomagnified, and transported over long distances. Thus, the chemical, physical, biological, and environmental properties of the so-called ‘dirty dozen’ , were used as the basis for the trigger values for persistence (P), bioaccumulation (B), toxicity (T), and propensity for long-range transport (LRT) that are currently used under the SC (Table 1). As has been pointed out elsewhere ,, there are no consistently applied criteria for classification of B other than the bioconcentration factor (BCF) in EC Regulation No. 1107/2009. 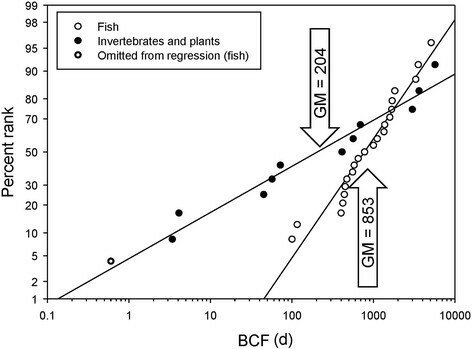 Although the bioaccumulation factor (BAF) is also used in the SC, other criteria for B, such as the biomagnification factor (BMF) and trophic magnification factor (TMF), have not been used explicitly, even though they are better descriptors because they incorporate the potential for dietary uptake and biotransformation in the aggregate measure of accumulation. Similarly, under the SC, toxicity is simply stated as ‘significant adverse’ effects… or ‘high toxicity’ with no indication of what ‘significant’ or ‘high’ means. From ,, 1DT50; note that the SC uses the term half-life but does not state whether this is is for dissipation or for degradation (transformation). Criteria for classification of pesticides or other chemicals as PBT under EC Regulation No. 1107/2009 or the program for REACH, which entered into force on 1 June 2007 (Table 2), are similar to those used for POPs (Table 1), but LRT is omitted and the triggers for P and B are more stringent. As has been pointed out elsewhere, criteria used to classify POPs and PBTs are single values  and the classification process, particularly for pesticides under EC Regulation No. 1107/2009, does not consider additional data on intensive properties as well as environmental fate and toxicity that are available for pesticides. Since REACH does not have jurisdiction over pesticides, such as CPY, classification of chemicals in commerce under this legal instrument is not further discussed, except for purposes of comparison. Assessment of chemicals to determine if they should be classified as POPs under the SC is a lengthy process involving nomination of candidate substances by a party or group of parties, review of data, and final recommendations from a review committee (the POPs RC) . This process is open, but there is no definitive framework for classification and criteria are sometimes inconsistently applied . After a COC is classified as a POP, it is added to Annex A (elimination), B (exemptions), or C (unintentional) of the SC. Since, under the SC, the UN does not have regulatory jurisdiction over the parties (signatory nations), ratification of classification and any subsequent phase-out and/or banning of the manufacture and use of the POPs are undertaken individually by the parties. In fact, the USA, which is a major player in the manufacture and use of chemicals, is not a signatory of the SC. Phase-out can take several years because time is provided for users to find substitutes and, in some cases, such as DDT, specific exemptions for continued availability may be granted for acceptable purposes such as for the protection of human health. Within the European Union (EU), criteria for assessment of plant protection products (PPPs) for PBT or POP properties are given in EC Regulation No. 1107/2009 and assessments of individual COCs are conducted by Rapporteur Member States (RMS) of the EU in much the same way as registration of new active ingredients. There is no explicit framework or guidance for classification other than a draft document from the EU Directorate General for Health and Consumer Affairs (DG SANCO) , and, unlike REACH , there is no guidance for how studies are to be evaluated or how the relevance of the data in these studies is to be assessed. REACH recommends the use of a WoE approach for assessing data on chemicals in commerce but does not describe how this is to be done. EC Regulation No. 1107/2009 does not mention WoE at all. Under EC Regulation No. 1107/2009, if a PPP is classified as P, B, and/or T, exceeding trigger values for all three criteria ultimately results in a ban of the use of the product in the EU. Exceeding two of the criteria results in the PPP being listed for substitution with alternative pesticides that do not exceed established trigger values. Since pesticides are designed to be toxic to at least some groups of organisms, the criterion for assessment of toxicity is likely to capture all pesticides. Therefore, classification of PPPs as PBTs under this scheme is primarily driven by the P and B. The trigger for classification as T (Table 2) is ‘Chronic NOEC <0.01 mg/L or is a carcinogen, mutagen, or toxic for reproduction, or other evidence of toxicity.’ The NOEC trigger is strictly for aquatic organisms, which will bias classification of insecticides as T because they are usually equally or more toxic to crustaceans than they are to insects. Few PPPs are deliberately applied to water, so fate and movement in the environment are important drivers of concentrations in water, yet these factors are not considered in classification. Finally, there is no consideration of toxicity for terrestrial species, despite the fact that it is to this environmental compartment that most pesticides are routinely applied. Registration and re-registration of pesticides in most jurisdictions require a large number of expensive and demanding studies under both laboratory and field conditions on fates and effects of pesticides in the environment as a whole. 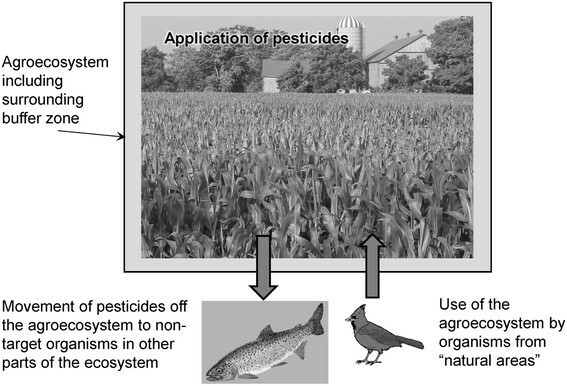 As illustrated in Figure 1, assessments of risk used during registration of pesticides are focused on protection of non-target organisms that enter and use the treated areas as habitat or that might be affected if the pesticide moves off the target agroecosystem. The assessment of risk conducted during registration includes characterization of bioaccumulation and metabolism in key species and toxicity to a range of species. In the process of decision-making, toxic potency to non-target organisms is considered and combined with exposures inside and outside of the agroecosystem to assess the acceptability of risks from the use of the pesticide. Illustration of the basis for risk assessment of pesticides. Risk, which is the relationship between toxicity and exposure, is not considered in the probabilistic sense in the classification of chemicals as POPs. The review process under the SC is designed to ‘evaluate whether a chemical is likely, as a result of its long-range environmental transport, to lead to significant adverse human health and/or environmental effects, such that global action is warranted’ [Annex E in 2], whereby the process is based on a deterministic hazard quotient (Annex E (b)). Under EC Regulation No. 1107/2009, binary criteria are used to categorize substances by comparing the properties of the compound to simple threshold or trigger values. This simplistic approach is appropriate for lower tier screening or priority setting, but it is not appropriate as a final step in decision-making. Goals for protection, sometimes referred to as ‘assessment endpoints,’ are usually either identified explicitly or implicitly in regulations. In terms of humans and the environment, the goals of EC Regulation No. 1107/2009 are ‘…to ensure a high level of protection of both human and animal health and the environment and at the same time to safeguard the competitiveness of Community agriculture.' . In the absence of more specific goals, it is logically assumed that the concern is for the general environment, not for a particular local scenario. For classification of COCs as POPs under the SC, this is a global concern. POPs identified under the SC are not permitted for use in the EU, so the environment of concern under EC Regulation No. 1107/2009 is that within the EU, which is the jurisdiction of regulation. With this in mind, characterization of P for the regional as well as the global environment was accomplished by refinement of the generalized assessment presented previously . The physical and chemical properties of CPY have been summarized relative to assessment of risk to the environment of the use of this product in agriculture in the USA ,, and are thus not repeated here. The focus of the following sections is on characterizing the P, B, and T properties of CPY in relation to criteria for classification under the SC and EC Regulation No. 1107/2009. Since Annex II 3.3 of EC Regulation No. 1107/2009 specifically includes metabolites, they were included in the assessment. Under environmental conditions, several transformation products of CPY are formed  and have been considered in the assessment of risks . CPYO is assessed in this document, but trichloropyridinol (TCPy) has not been identified as a metabolite of toxicological or environmental concern , and was excluded from consideration here. Because of similarities in the structure of TCPy to trichlorophenol, from which dioxins and furans are known to be formed, the possibility of this occurring with CPY was considered. Dibenzo dioxins and furans were not detected (limit of detection (LOD) 0.006 to 0.0008 ng/g) in formulations of CPY . A recent study reported the formation of 2,3,7,8-tetrachloro-1,4-dioxino-[2,3-b:5,6-b'] dipyridine (TCDD-Py), an analog of 2,3,7,8-tetrachlorodibenzo-p-dioxin (TCDD), when pure (2 mg) CPY was pyrolyzed in sealed ampules at 380°C, but not 300°C or 340°C, for 15 min in the presence of 10 mL of air . Greater amounts of TCDD-Py (≈100-fold) were formed from pure TCP under all of the above conditions. TCDD-Py is unstable under the conditions of synthesis of CPY from TCP , suggesting that, even if it is formed, it will not become a contaminant in the commercial product. In a study of effects of combustion on the fate of TCP, only TCP and CO2 were identified in smoke from cigarettes containing residues (900 ng/cigarette) of 14C-labeled TCP. Detection limits for hexane-extractable non-polar compounds (2% of total radioactivity applied) such as TCDD-Py were not provided . Dibenzo-p-dioxins have been observed in formulations of chlorinated pesticides, such as 2,4-D, exposed to sunlight . A study of photodegradation of 14C ring-labeled CPY in buffered and natural waters treated with 0.5 and 1 mg CPY/L did not reveal the presence of polar compounds except CPY and dichloropyridinyl phosphorothioate esters and 96% of the degradates formed were polar compounds . Dioxins such as TCDD are rapidly photolyzed by sunlight in the presence of a hydrogen donor with a half-life of the order of hours . Thus, if TCDD-Py was formed in sunlight, it might be expected to be photolabile and non-persistent in the environment. A search of the literature failed to reveal the isolation and identification of TCDD-Py in the environment, either because it is not formed in detectable amounts, because it is rapidly degraded, or because it has not been analyzed for. The only papers that reported on its formation and/or biological activity , did not conduct analyses of environmental samples. They also did not test whether TCDD-Py was formed by photolysis from CPY or TCP. TCDD-Py is only moderately toxic to rats. It has an oral median lethal dosage (LD50) of 300 mg/kg body mass (bm) in rats (strain unspecified), about four orders of magnitude less toxic than TCDD, which has an LD50 of 0.022 to 0.045 mg/kg bm . Tests in female Sprague-Dawley rats exhibited loss of body mass but no lethality or gross pathological findings at an even greater acute oral dose of 600 mg/kg bm . The same study reported no evidence of chloracne on the ears of NZ white rabbits treated 18 times with a solution containing 50 mg TCDD-Py/L . On the basis of this evidence, we conclude that TCDD-Py is either not formed from CPY or TCP under normal conditions of use or the amounts formed are so small that it has escaped notice in the analyses of bioaccumulative substances in environmental samples. In addition, the relatively low toxicity of TCDD-Py indicates that, even if formed in the environment, it presents little risk to humans or the environment. Thus, TCDD-Py was not included in the following assessment. Since there was little guidance in categorizing POPs and PBTs [with the exception of 21], WoE was used to select the most appropriate data for inclusion in the assessment. WoE is a phrase that is widely misused in the literature  and has been applied to a number of procedures for assessment of risk. Here, WoE is used as a quantitative procedure for evaluating the strength of studies, based on how they were conducted, and the relevance of the data from the studies to characterization of the COC, CPY, as a POP or PBT chemical. Strength of studies was evaluated by a numerical scoring system (see the ‘Quality assurance’ section). Relevance was also assessed, particularly in the case of persistence, where studies were conducted at very large rates of application, such as for control of termites, which are inconsistent with current uses, and in the case of bioconcentration, where studies were conducted at exposures greater than the maximum solubility of the CPY in water. All of the available data were evaluated (see Additional file 1), and then, on the basis of strengths of the studies, those studies that provided the most robust data were selected for inclusion in the assessment of the PBT properties of CPY. Studies conducted under non-relevant conditions were then excluded to provide the most robust and relevant data for the characterization. This procedure is different from the assessment conducted by Mackay et al. where all data were used, regardless of their strength or relevance. Because extreme (worst-case) values observed in specific conditions are not representative of all situations, mean values were used for comparison to the criteria for classification, a process which has been recommended in the literature  and the draft guidance of SANCO . Because most of the processes related to P or B at environmentally relevant concentrations are driven by first-order or pseudo-first-order kinetics and thus are lognormally distributed, geometric mean values are the most appropriate for comparing triggers for classification and were used in this assessment. Since persistence of CPY in the environment is dependent on its unique properties as well as the properties of and conditions in the surrounding environment, in the context of global persistence, all acceptable values for assessment of CPY as a POP were combined . Because of the regional focus of EC Regulation No. 1107/2009, data for persistence were segregated into studies from the EU and from other regions. These data were analyzed separately. In addition to consideration of characteristics related to P, B, and T, other lines of evidence were also used as a means of corroboration of the more simple criteria for classification. As in the SC, one line of evidence was based on reports of bioaccumulation of CPY in organisms in the field. Concentrations in aquatic systems in the USA have been thoroughly reviewed  and were not included in the assessment presented here other than in the context of assessing exceedences of criteria for toxicity and their rapid response to changes in pattern of use. An exhaustive review of the literature was conducted in support of an ecological risk assessment of CPY [14, et seq. ], and results were compiled into an electronic database, which formed the basis for the information used in this report. The extensive search of the available literature was conducted by using Web of Knowledge®, a database with access to a number of other digital collections and databases. In addition, searches were conducted with Google Scholar using keyword string searches to access other available peer-reviewed resources. Recent reviews of the literature on the properties of CPY , provided an overview of pertinent studies. Also included in the reviewed body of work were relevant unpublished studies from Dow AgroSciences and its affiliates, which were provided to the authors in their original forms. From the results of the extensive literature search, those studies judged to be directly related to persistence and/or bioaccumulation of CPY were retained for further assessment. These included studies on persistence in sediment, soil, and water, performed under laboratory or field conditions, and studies from any international jurisdiction. In total, 41 papers or reports on bioaccumulation of CPY in biota and 90 papers or reports on persistence of CPY in soil, sediment, and/or water were included in the scoring evaluation. Data on toxicity to aquatic organisms were previously screened for quality  and were used in this assessment without further characterization. Those papers retained from the literature search were subjected to a WoE assessment with the aim of identifying those studies that should form the basis of the final report. Scoring used in our evaluation was based on criteria developed for inclusion of data in the International Uniform Chemical Information Database (IUCLID)  and more current updates. The system was augmented by application of numerical scores as has been done previously for selection of toxicity data for CPY . Specific scoring criteria were developed for each type of exposure, including bioaccumulation in sediment-dwelling organisms, aqueous bioconcentration, bioaccumulation from dietary exposure, persistence in soil, persistence in sediment, and persistence in water. These criteria were based on OECD methods for testing  under the relevant conditions (OECD Methods 305, 308, 309, and 315). Criteria assessed the strength of the methods used in each study, and a score of 0, 1, or 3 was assigned for each criterion, indicating that the criterion was not met, was attempted but not fully met, or was fully achieved, respectively. The scoring matrices are provided (see Additional file 1: Table S1). A consensus score was also available as part of the strength of methods as a mechanism to adjust scores for those few studies where an invalidating error was not captured by the standard matrix for evaluation. In addition to assessing the strength of methods, the relevance of the study was also assessed by setting limits for rates of application that would be considered environmentally relevant (based upon current recommended use rates ) and assigning a score of 0, 1, or 3 for relevance. A full score was assigned if the rate of application was equal to or less than the relevant rates of 200 μg/L (accumulation in water), 1,000 μg/L (persistence in water), or 8 mg/kg (accumulation or persistence in soil/sediment), a score of 1 was assigned if the rate was within 25% of the set value (i.e., μ250 μg/L, 1,250 μg/L, or 10 mg/kg), and a score of 0 was assigned if the rate was more than 25% above the set value for environmental relevance. Criteria for relevance also evaluated whether a description of variance was provided, whether dietary spiking was performed at appropriate concentrations (residues not exceeding 5 μmol/g) and/or whether BAF was calculated kinetically from the depuration rate constant, as appropriate for each type of study. Briefly, the process of evaluation proceeded as follows: a study that had been identified through review of the literature and screening process was scored according to the appropriate matrix. Scores were recorded, along with a description of the study methods, and a summary of the reasons for the assigned score for each criterion. Where a specific study element or criterion was not explicitly addressed in the paper and could not be readily inferred from the results, it was assumed that the criterion was not met and a reduced score was assigned. If a missing element made the assessment impossible or if it was not possible to score a particular criterion for an individual study, that criterion was omitted from the scoring. This most commonly occurred for the use of a solvent in studies of bioaccumulation, where a solvent was not required, but in the case where it was used, it should be one from an approved list. In cases where no solvent was used, that criterion was omitted from the assessment. In total, assessments were completed for 44 bioaccumulation studies and 90 persistence studies, and the scores are summarized in Additional file 1: Tables S2 through 5. It was not possible to obtain a copy of one report on bioaccumulation and two papers on persistence that had been identified during the review of the literature, so these studies could not be assessed. After assessment, those studies that received scores of less than 50% for strength of methods were excluded for the purposes of this assessment. In total, 23 studies of bioaccumulation of CPY and 44 studies of persistence of CPY were included in the final assessment. Persistence was assessed by determining the half-lives for degradation in soils, sediments, and surface waters. Information from both laboratory and field studies was considered. In the case of field studies, some losses might have occurred via volatilization; however, this is a realistic loss process affecting exposure in the field. Thus, these dissipation data are appropriate for inclusion in the assessment as long as the degradation in the compartment into which partitioning occurs, in this case air, is considered as well. Studies conducted in the laboratory at normal ranges of temperature (15°C to 35°C) were included in the assessment because these temperatures were representative of the surface layers of the soil in the regions from which the samples were obtained. Since the relatively large KOC of CPY limits mobility in agricultural soils, surficial temperatures are more representative of the environment in which CPY would be expected to occur. Data from field studies were assumed to have been conducted at realistic temperatures. Use of a half-life implies first-order kinetics, but most environmental degradation processes are of second order in the concentration of the chemical and the concentration of the reactant, either a chemical or the number of microorganisms. Concentrations of reactants can vary widely; thus, half-lives are expected to vary considerably, especially in field studies. Use of extreme values for assessment purposes can be highly misleading since they likely reflect unusually small reactant concentrations. The geometric mean was used in this assessment as a more rigorous approach and is recommended for assessment of PBT . In soils, CPY can be degraded by hydrolysis and also microbial transformation. Half-lives for dissipation from soils via all pathways ranged from 1.1 to 1,576 days (see Additional file 1: Table S2). There were several outliers that were excluded from the assessment because the application rates were large (i.e., 1,000 mg/kg for control of termites)  and were phased out in 2000. Lesser rates of application (10 and 100 mg/kg) were included in the assessment. Studies of CPY in soils were divided into those conducted under European conditions and those conducted with soils from other areas of the world. Studies were also stratified by whether they were conducted under laboratory or field conditions. 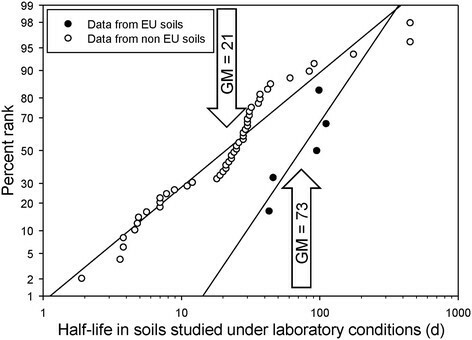 For European soils , and non-European soils (Figure 2) ,- studied under laboratory conditions, the geometric means were 73 and 21 days, respectively. These geometric means do not exceed the criterion for classification as a POP under the SC (180 days) or as persistent under EC Regulation No. 1107/2009 (120 days). The geometric mean half-life for all laboratory-based data for soils without exclusion of studies was 32 days , also less than the criteria for POPs or PBT. Half-life values measured under laboratory conditions for chlorpyrifos (CPY) in soils from European and non-European locations. Geometric means are indicated by vertical arrows. Geometric means of half-lives derived from field studies in European soils - and non-European locations ,- (Figure 3) were 20 and 13 days, respectively. None of the geometric means for dissipation of CPY in soils under field conditions exceeded the threshold to be classified as being persistent in soils under the SC or EC Regulation No. 1107/2009. The geometric mean half-life for all field-based data for soils without exclusion of studies was 22 days , also less than the criteria for POPs or PBT. 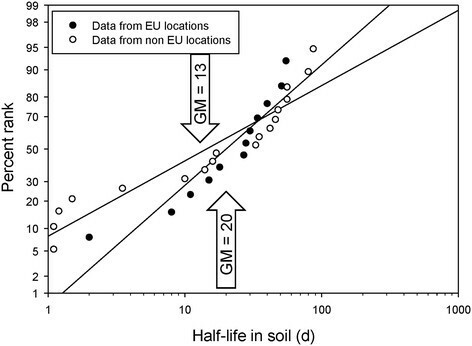 Half-life values measured under field conditions for chlorpyrifos (CPY) in soils from European and non-European locations. Geometric means are indicated by vertical arrows. Given the relatively short half-lives observed in soil, CPY is very unlikely to accumulate in soils as a result of repeated use in agriculture. Thus, treated soils will not act as a reservoir for other matrices such as water. This is consistent with rapid decreases in concentrations of CPY in surface water after changes in patterns of use (see the ‘Measured concentrations in surface waters’ section). In sediments, under laboratory and field conditions, the half-life of CPY ranged from 1 to 223 days (see Additional file 1: Table S3). The geometric mean of all studies was 29 days. When only those studies that scored in the top 50% of studies were included, the geometric mean was 25 days. 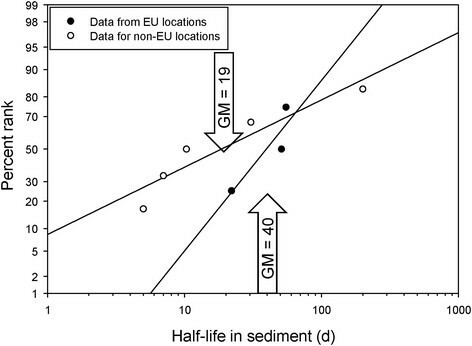 When studies conducted with European and non-European sediments were considered separately (Figure 4), the geometric means were 40 and 19 days, respectively. None of the geometric means exceeded the threshold for classification of CPY in sediments as being persistent under EC Regulation No. 1107/2009. Even the maximum values of 200 and 230 days were only slightly greater than the 180 days necessary to classify CPY as being persistent in sediment. The geometric mean half-life for all studies (without exclusions) was 38 days , which is also less than the criteria for POPs or PBT (180 and 120 days, respectively). 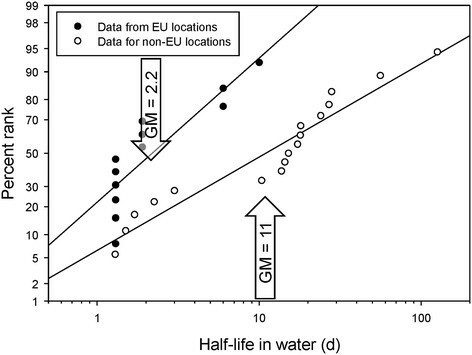 Half-life values measured under laboratory conditions for chlorpyrifos (CPY) in sediments from European and non-European locations. Geometric means are indicated by vertical arrows. In water, CPY can be degraded abiotically by aqueous hydrolysis, photolysis, and microbial transformation. The following sections summarize data on persistence in water. In water, hydrolysis is one of the primary mechanisms of degradation of CPY. Aqueous hydrolysis of CPY is inversely proportional to pH  (see Additional file 1: Figure S1). In aquatic systems at 25°C, half-lives of 73, 72, and 16 days were measured at pH 5, 7, and 9, respectively [summarized in 67]. In distilled water, in the absence of light and microorganisms, the half-life ranged from as little as 0.01 to 210 days, depending on pH - (see Additional file 1: Table S4D). Data for half-life measured in distilled were not included in the assessment as this matrix is not environmentally realistic. At pH >6 to <10, the half-life of CPY ranged from 4.5 to 142 days. When the pH was greater than 10, the half-life was as short as 0.01 day. In this assessment, hydrolysis in natural water was considered realistic and was included, regardless of pH. Half-lives of 22 to 51 days have been reported from metabolism studies conducted in aerobic aquatic systems ,. In the presence of natural sunlight, in sterile pH 7 phosphate-buffered solution, the half-life was 30 days . Thus, dissipation attributable to photolysis was not much different from that attributable to hydrolysis alone. In their simulations of the dynamics of CPY in aquatic systems, the US EPA  used an aqueous hydrolysis half-life of 81 days at pH 7.0. In surface waters measured in the laboratory, half-lives of CPY ranged from 1.29 to 126 days ,,, (see Additional file 1: Table S4B). In an analysis of half-lives in water-only studies with WoE scores greater than 50%, the geometric mean half-life for all waters tested in the laboratory was 6 days. The geometric mean half-life for all laboratory-based data without exclusion of studies was 21 days . When studies conducted with waters from European locations (Figure 5 and Additional file 1: Table S4A) , and non-European locations (Figure 5 and Additional file 1: Table S4B) ,,, were considered separately, the geometric means were 2.2 and 11 days, respectively. There were no field data from the EU, but the geometric mean of field data from non-EU locations , was 6 days (see Additional file 1: Table S4C). None of these geometric mean values exceeds the criterion for persistence (60 days) in water for classification as a POP under the SC or as persistent (40 days) under EC Regulation No. 1107/2009. Half-life values measured under laboratory conditions for chlorpyrifos (CPY) in natural waters from European and non-European locations. Geometric means are indicated by vertical arrows. The geometric means of half-lives of CPY in soils, sediments, and surface waters were less than the thresholds for classification of a compound as being persistent in soils, sediments, and water under the SC or EC Regulation No. 1107/2009. These conclusions are the same as those reached in an assessment of all the data on persistence in the earlier assessment by Mackay et al. .
No studies on persistence CPYO have been reported in the literature, and it has not been detected as a metabolite in studies on dissipation of CPY in soils . This, along with its short half-life in water (4.7 days at pH 7), supports the conclusion of Mackay et al. that CPYO is less persistent than the parent compound, CPY, and therefore does not trigger the criterion for persistence under the SC and EC Regulation No. 1107/2009. The major focus of assessing bioaccumulation under the SC (POPs) and EC Regulation No. 1107/2009 (PBT) is on concentration from the matrix into the organism as a BCF. Data for BCF (and BAF and biota-sediment accumulation factor (BSAF)) from the literature were selected based on the quality of the study and relevance of the exposure concentration (see Additional file 1: Table S5). These data are a subset of a larger data set from Mackay et al. . BCF data for fish were separated from other aquatic organisms. For an amphibian, invertebrates, and plants, BCF, BAF, and BSAF were taken as equivalent for the purposes of analysis and values are presented graphically (Figure 6). As for toxicity values (below), all data were combined in the analysis. Graphical presentation of BCF (BAF and BSAF) values for chlorpyrifos (CPY) in aquatic organisms. Geometric means are indicated by vertical arrows. Empirical values for BCFs for fish ranged from 0.6 to 5,100 - (see Additional file 1: Table S5A). From the distribution, the smallest value was clearly an outlier and was omitted from the calculation of the geometric mean and the regression. The geometric mean value for BCF for fish was 853, less than the criterion for EC Regulation No. 1107/2009 (2,000) and the SC (5,000). BCFs are often estimated from the octanol-water partition coefficient (KOW), especially when there is a lack of empirical data. In the case of CPY, KOW is approximately 100,000 . Thus, a fish containing 5% lipid would be expected to have a BCF of approximately 5,000, which is at the extreme of empirical observations. This suggests that CPY is subject to loss processes from fish in addition to respiratory loss, the obvious process being metabolic biotransformation, but growth dilution and egestion may also apply. The BCF (and BAF and BSAF) for invertebrates and plants (see Additional file 1: Table S5B) ranged from 3.4 to 5,700, with a geometric mean of 204. For plants, the greatest value was reported for duckweed (Lemna minor, 5,700) with water lettuce (Pistia stratiotes, 3,000), the third largest and both greater than algae (Oedogonium cardiacuin, 72). The larger values for the two macrophytes might be more reflective of adsorption to the surface of the plant than uptake into the plant. The BCF values in the invertebrates ranged from 3.4 to 691, both in mollusks. The value for the only amphibian (Ambystoma mexicanum) in the data set was 3,632, which is in the same range as those reported for fishes. The geometric mean value for invertebrates and plants (204) was less than the criterion for EC Regulation No. 1107/2009 (2,000) and the SC (5,000). No data on biomagnification of the toxicologically relevant metabolite of CPY, CPYO, were found in the literature. Although CPYO is formed in the atmosphere, it is reactive and has a shorter half-life in water (4.7 days at pH 7) than the parent (geometric mean of 2.2 to 11 days) . Despite extensive sampling of surface waters in areas of more intensive use, CPYO has never been detected above the LOD . Lack of observed bioconcentration or biomagnification of CPYO is completely consistent with the greater reactivity of the molecule and its greater solubility and smaller KOW than CPY . All the evidence suggests that CPYO does not biomagnify. Concentrations of chemicals such as CPY in organisms collected in the field are another line of evidence of bioconcentration and biomagnification. In an extensive survey of chemicals in fish from lakes and reservoirs of the USA , residues of CPY were not detected. The method detection limit was 59 μg/kg, and 486 samples from predatory fish and 395 samples from bottom-dwelling fish were analyzed. Concentrations of CPY in samples of fish from lakes in Western National Parks of the USA were all <1 μg/kg (wet mass; wet. ms.) . Taken together, this is further evidence of lack of significant bioconcentration or biomagnification of CPY into fishes or biomagnification in the aquatic food chain. Apart from the detections in plants in montane areas of California discussed in Mackay et al. , there are reports of detections of small concentrations in plants from more remote areas such as in the panhandle of Alaska  (2.4 ng/g lipid mass (l. ms.) in needles of conifers, see the ‘Measured concentrations near areas of use’ section). Chlorpyrifos was detected in lichen (0.073 ± 0.23 ng/g l. ms.), mushrooms (0.78 ± 0.82 ng/g l. ms.), green plants (0.24 ± 0.47 ng/g l. ms.), caribou muscle (0.57 ± 0.19 ng/g l. ms.), and wolf liver (<0.10 ng/g l. ms.) in Nunavut . A characteristic of POPs is biomagnification or trophic transfer in food chains, and this provides another line of evidence to assess CPY. Only one study was found on movement of CPY in food webs. Several current-use pesticides were measured in a terrestrial food web in the Canadian Arctic , and CPY was detected frequently in moss and mushrooms (83% to 86%) but at lesser frequency in lichens, willow, and grass (44% to 50%). Concentrations ranged from 0.87 ng/g l. ms. in moss to 0.07 ng/g l. ms. in lichen. Concentrations in caribou muscle and total body burden provided BMFs of 7.8 and 5.1 compared to lichen; however, the BMF from caribou to wolf was <0.10 (based on concentrations < MDL). Trophic magnification factors for the lichen-caribou-wolf food chain were all <1 for muscle, liver, and total body burden. That small concentrations of CPY were found in the Arctic is indicative of some long-range transport, but the lack of BMF between caribou and wolf and TMFs of <1 are indicators of no significant trophic magnification of CPY in the food chain. These additional lines of evidence support the laboratory and microcosm data, which indicate that CPY does not trigger the criterion for bioaccumulation under the SC or EC Regulation No. 1107/2009. Toxicity of CPY to aquatic organisms has been reviewed in detail previously in Giddings et al. , to birds in Moore et al. , and to the honeybee in Cutler et al. . Rather than repeat this information here, the reader is referred to these papers and their relevant supplemental information. The following sections summarize the toxicity data and discuss this in relation to the classification criteria for POPs and PBTs. Because CPY dissipates and degrades rapidly in aquatic environments and is only present for short durations (≤4 days), data on acute toxicity were selected as the most appropriate for assessment of risks in aquatic systems . There were numerous published studies on laboratory toxicity tests for aquatic organisms. These data were screened for quality and a subset of the higher quality and most relevant studies were used in the assessment . Toxicity values were analyzed as distributions (species sensitivity distributions (SSDs)) using SSD Master Version 3.0 software  and 5th centiles (HC5 concentrations) used to characterize toxicity of CPY to major taxa (Table 3). These acute toxicity values were not separated by type of medium (saltwater or freshwater) or origin of the species (tropical, temperate, Palearctic, or Nearctic). Analysis of the large amount of toxicity data available for CPY has shown that there are no significant differences in sensitivity between these groups . Thus, these data are appropriate for classification in the global context (POPs) and in the regional context (PBT). Several studies of effects of CPY have been conducted in aquatic meso- and microcosms (cosms) and were reviewed in Giddings et al. . These studies were conducted in various jurisdictions and climatic zones, including Europe (Netherlands and Mediterranean locations), the US Midwest, Australia, and Thailand. Half of the 16 studies reported no-observed-adverse-effect concentrations (NOAECeco) values as ‘less than' values. For the eight studies in cosms where NOAECecos were available, all were ≥0.1-μg/L and the geometric mean was 0.14 μg/L. The NOAECeco is based on observation of short-term effects in some sensitive organisms, from which there is rapid recovery. For a pesticide, such as CPY, which degrades relatively rapidly in the environment, this is an appropriate measure of a threshold for toxicity under realistic environmental conditions. Because studies in cosms incorporate toxicity of organisms from the region, as well as processes related to fate that may be influenced by local conditions such as climate and hydro-geo-chemistry, there may be regional differences in responses. This was not the case for CPY; the NOAECeco values were the same regardless of location of the study. This not only is consistent with lack of region-specific toxicity tests but also suggests that the fate processes that can influence exposures in aquatic systems are not different between regions. Thus, it was not necessary to separate the studies in cosms for purposes of classification of POPs and PBTs. Because CPY is used as a pesticide to protect crops from damage by arthropods, it is obviously toxic to terrestrial stages of insects. This is a benefit of use and is not considered an adverse effect. However, toxicity to valued arthropods can be considered an adverse effect and, in the case of the honeybee, was characterized in a risk assessment of CPY . CPY is toxic to the honeybee by direct contact (topical toxicity) with the spray and also via the oral route. The former route of exposure is only relevant when bees are present during or shortly after spraying and is mitigated by restrictions on the label (see the ‘Reports of toxicity under current conditions of use' section below). Topical 24- to 48-h LD50 values for formulated CPY range from 0.024 to 0.54 (geometric mean =0.123) μg a.i./bee and 0.059 to 0.115 (geometric mean =0.082) μg a.i./bee for the technical product. Oral 24- to 48-h LD50s ranged from 0.114 μg a.i./bee for the technical to 0.11 to 1.1 (geometric mean =0.36) μg a.i./bee for the formulated material . Significant toxicity to honeybees has only been associated with direct exposure during spraying and/or during foraging for nectar and/or pollen in recently treated fields (0 to 3 days post spray). Toxicity has not been reported to be caused by CPY outside the foraging range of the bees, and residues in samples of brood comb have not been casually linked to colony collapse disorder . There is no evidence to suggest that small concentrations measured outside the areas of use are toxic to bees or other beneficial insects. As the honeybee is found in the EU, North America, and other parts of the globe, there is no need to consider this species differently across locations. The conclusions regarding toxicity to honeybees thus apply to considerations of POPs and PBTs. Toxicity to birds has been characterized previously by Moore et al. . Because of rapid dissipation of CPY in the environment and in animals, acute toxicity data were considered most relevant for assessing risks. Acute LD50s ranged from 8.55 to 92 (geometric mean =30.5) mg CPY/kg bm in 14 species of birds. Few chronic toxicity data were available, but values for the NOEC and LOEL in the mallard duck exposed via diet for 28 days were 3 and 18.7 mg CPY/kg bm/day, respectively . Risks of CPY to birds foraging in treated fields were considered de minimis for most species, except sensitive species foraging in crops with large application rates (e.g., citrus). This conclusion was consistent with the lack of observed mortality of birds in field studies conducted in North America and the EU. Mammals are less sensitive to CPY than birds. Acute LC50 values for laboratory test species ranged from 62 to 2,000 mg CPY/kg bm . Several assessments of risk have concluded that birds are more sensitive and more likely to be exposed and are protective of risks from CPY in wild and domestic mammals and that risks to these organisms are de minimis,. Given de minimis or very small risks from exposures in areas of use, concentrations of CPY reported from semi- and remote locations present even lesser risks to birds or mammals. Acute and chronic dietary toxicity values for CPYO have been measured in birds (Table 4). Although data were few, toxicity values were similar to those for CPY, suggesting, as would be expected from the mechanism of action, that CPYO has similar toxicity to the parent CPY. Although there are no known situations where exposures of aquatic organisms to CPY are long-term, some toxicity tests, such as mesocosm studies, have used repeated exposures with no hydraulic flushing to assess the equivalent of repeated exposures. The most sensitive NOEC reported for an aquatic organism was from one of these studies: 0.005 μg CPY/L for Simocephalus vetulus in a mesocosm experiment . This value is relevant to assessment of CPY as a PBT chemical. The above conclusions of lack of significant toxicity to aquatic and terrestrial organisms under current conditions of use in the USA is supported by the very few reports on fish, invertebrate, bee, and bird kills reported in the last 12 years ,,. Where these few incidents have occurred, most have been the result of accidents or deliberate misuse. The criterion for toxicity for classification of POPs is ‘significant adverse effects' without a clear definition of ‘significant' or the location of the effects. We have interpreted that to mean that the use of CPY results in unacceptable risks in areas outside but not directly adjacent to the area of application (i.e., edge of field). As a pesticide, risks to target organisms in the agricultural field are accepted, but risks to non-target organisms, especially outside the areas of application, are considered undesirable. None of the data on toxicity of CPY or CPYO to non-target organisms suggests that there are significant adverse effects in the environment outside of the areas of use ,,,. Even in areas of use, risks to birds and mammals are small or de minimis. The data on toxicity of CPY and CPYO to birds, mammals, and aquatic organisms determined under laboratory conditions is robust. These data are complemented by studies in aquatic cosms, which are more representative of exposures in natural environments, showing similar patterns of toxicity and including species that have not been tested in the laboratory under guideline protocols. There are some uncertainties. Not all species have been tested and many groups of marine species have not been tested at all; however, this is not unique and applies to pesticides other than CPY and to chemicals in general. Considering all of the data on toxicity, we conclude that CPY and CPYO do not exceed the POPs criterion of ‘significant adverse effects' (Table 1) for toxicity to organisms in the environment. The criterion for classification of pesticides as toxic under EC Regulation No. 1107/2009 is ‘Chronic NOEC <0.01 mg/L (10 μg/L) or is a carcinogen, mutagen, or toxic for reproduction, or other evidence of toxicity' (Table 2). As has been discussed before , the criterion refers only to aquatic organisms and terrestrial organisms are not considered. The NOEC for S. vetulus (0.005 μg CPY/L) is less than the criterion, so CPY would be classified as T. In addition, the acute toxicity values for CPY for many crustaceans and insects, and even some fish, were <10 μg CPY/L . Given that CPY is an insecticide and that crustaceans and insects are the most sensitive taxa , this is not unexpected. However, several additional factors that place toxicity in perspective must be considered. CPY is not applied directly to water, so exposures in this environment are indirect and small . Since CPY is not persistent in water or other environmental compartments, chronic toxicity values are not environmentally realistic or appropriate for classification of toxicity. There is robust evidence to show that CPY is not sufficiently persistent in any environmental compartments to justify durations of exposure associated with chronic toxicity. Thus, it would have been inappropriate to compare concentrations in remote regions to those associated with chronic effects of CPY. No chronic toxicity data for CPYO were available; however, it has a relatively short half-life in water  and has not been detected in surface waters, even in areas of high use . Carcinogenicity, mutagenicity, or reproductive toxicity of CPY were not assessed in this evaluation, but have been assessed in recent reviews by the US EPA as part of the re-registration process. Based on current use patterns, CPY was not identified as a mutagen, carcinogen, reproductive toxicant, or immunotoxic agent . The very small concentrations reported in semi- and remote areas do not represent a risk to humans through drinking water or via the food chain. The potential for LRT is considered in both water and air. Since the half-life of CPY in water does not exceed the criterion for persistence in water (see the ‘Water' section), it is unlikely that LRT in water would be a significant issue. Thus, the potential for LRT of CPY and CPYO in the atmosphere was assessed in detail. The criterion for LRT in air under the United Nations Economic Commission for Europe  is that the half-life is ≥2 days (Table 1) or that monitoring or modeling data demonstrates long-range transport. Since masses of air containing volatilized CPY can move, a static determination of the half-life in air is not instructive. The issue is: can CPY persist long enough to move significant distances from where it is released and deposit into soils and water at concentrations sufficient to cause adverse effects? Evidence that CPY is subject to LRT is provided in reports of concentrations in air and other media at locations remote from sites where CPY is applied in agriculture . The assessment reported by Mackay et al. used a combination of analyses, including measured concentrations at locations distant from sources, in conjunction with mass balance modeling. Predictions of atmospheric transport were made by the use of simple mass balance models such as TAPL3 and the OECD Tool ,,. These models have been used in regulatory contexts and characterize LRT as a characteristic travel distance (CTD), which is defined as the distance that approximately two thirds of the originally released mass of CPY or CPYO is transported from the source before it is deposited or transformed. Detailed assessments of the properties of CPY ,, and its fate in the environment and potential risks  have been published previously ,. CTDs of several pesticides, including CPY, have been estimated . Results of these modeling exercises have suggested a CTD of 280 to 300 km for CPY if it is assumed that the atmospheric half-life is 12 h, the narrow range being the direct result of close similarities between the model equations. As is discussed below, this estimate of CTD reflects an unrealistically long atmospheric half-life. The assessment of LRT presented here went beyond determination of CTD and the related characteristic travel time (CTT) and also included consideration of estimates of concentrations of CPY and CPYO in other environmental media such as rain, snow, and terrestrial phases, as well as in the atmosphere at more remote locations, including higher altitudes . A relatively simple mass balance model was developed and used to predict concentrations in various media at various distances from sources where CPY was applied in agriculture, which could be compared to measured concentrations of CPY in air and other media. Results of the model can then serve as a semi-quantitative predictive framework that is consistent with observations. As an example of dissipation of a parcel of air containing 100 ng CPY/m3, which is typical of concentrations 1 km from application sources, a model was developed to assess the concentration as it is conveyed downwind . The mass would be decreased as a result of transformation processes, primarily reaction with •OH radicals, deposition, and dilution by dispersion. Oxidation results in formation of primarily CPYO. By using the TAPL3 simulation of a relatively large environmental area and a half-life in air of 3.0 h and conservative (longer duration) half-lives in other media and assuming an emission rate to air of 1,000 kg/h, the resulting mass in air is 4,328 kg, the residence time in air and the CTT is 4.3 h, and the corresponding rate constant for total loss is 0.231/h. The CTD of approximately 62 km is the product of 4.3 h and the wind velocity of 14.4 km/h. The rate of transformation is 993 kg/h, and the net losses by deposition to water, vegetation, and soil total about 7 kg CPY/h, which corresponds to a rate constant of 0.0016/h and is less than 1% of the rate of degradation. The critical determinant of potential for LRT is the rate of transformation from reactions with •OH radicals in air. If the half-life is increased by an arbitrary factor of 4 to 12 h, as was assumed in , the CTD increases to 244 km . Results of simulation models predicted concentrations and partial pressures or fugacities (expressed in units of nPa) at several distances from application of CPY in typical agricultural uses. A simple but approximate approach to estimate concentrations of CPY at distances from sources is to use a dispersion model to estimate concentrations at ground level from a ground-level source using standard air dispersion parameters . Near the area of application, such as at a distance of 1 km and assuming a 0.1-h air transit time, air concentrations (C1 km) were assigned a value of 100 ng CPY/m3 (approximately 700 nPa). Concentrations of CPY are primarily controlled by rates of evaporation and dispersion rather than reactions with •OH. At a distance of 120 km and a transit time of 8.4 h, which is equivalent to two CTDs, 84% of the volatilized CPY would have been transformed and the concentration of CPY in air would be 0.022 ng CPY/m3 (0.16 nPa). At steady state, rain water would have a concentration of 0.1 ng CPY/L and snow a concentration of 1.5 ng CPY/L. If a very conservative half-life of 12 h for CPY were assumed, the fraction of CPY transformed would be only 38% and thus greater concentrations of CPY would persist for longer distances. At a distance of 300 km and a transit time of about 20 h, which is equivalent to approximately five CTDs, 1.0% of the initial mass of CPY would remain because the CPY would have been subjected to nearly seven half-lives. Concentrations at this distance from the source would likely be 0.0003 ng CPY/m3 (0.002 nPa) or less. Concentrations of 0.003 ng CPYO/m3 would be expected. Thus, at this distance from the source, CPYO would be the primary product present, at a concentration which is near the typical limit of quantitation. Rain, if at equilibrium with air, would be expected to contain a concentration of 0.001 ng CPY/L and snow 0.02 ng CPY/L. Given an assumed half-life of 3 h and the time to be transported this distance, it is unlikely that, under normal conditions, significant quantities could travel more than 300 km. Observations of detectable amounts of CPY at greater distances, such as 1,000 km , suggest that, at least under certain meteorological conditions as may apply at high latitudes or times of low solar radiation and less production of •OH radicals, the half-life is longer than was assumed in this analysis. The significant conclusion is that partial pressures, fugacities, and concentrations in air at distances of 100 s of km are expected to be reduced by a factor of a million or more from those within a km from sources. While the vapor pressure of CPY is considered to be moderate, CPY can be measured in the air during and after application. In the 12 h following application of the liquid formulation to the surface, approximately 10% to 20% of the applied material volatilizes, but variability is expected diurnally, with temperature, rainfall, and soil moisture content. Sorption then ‘immobilizes' the CPY and subsequent volatilization is slower, with a rate of approximately 1% per day that decreases steadily to perhaps 0.1% per day in the subsequent weeks . Concentrations in air that exceed 20 ng CPY/m3 have been observed near sources of application in agriculture . Concentrations of CPY in air immediately above a potato field in the Netherlands at noon in midsummer ranged from 14,550 to 7,930 ng/m3 at 1 and 1.9 m above the crop 2 h after application . These decreased to a range of 2,950 to 1.84 ng/m3 after 8 h and to 26 to 15 ng/m3 in the 6 days following application. Concentrations of CPY in air following an application of 4.5 kg/ha to turf were in the range of 1,000 to 20,000 ng/m3. This might be a ‘worst case' in terms of concentrations and represents approximately 10% of the saturation concentration in air, i.e., the vapor pressure/RT, where RT is the gas constant-absolute temperature group. Concentrations of approximately 100 ng CPY/m3 are regarded as typical of areas immediately downwind (approximately 1 km) of application sites . Chlorpyrifos and CPYO have been detected in the environment . Concentrations in the range of 0.01 to 10 ng CPY/m3 that have been reported at distances of up to 100 km from sources are considered to be regional. Concentrations less than 0.01 ng CPY/m3 have been observed in more remote areas. Approximately 70% of the data for concentrations in air were in the range of 0.01 to 1.0 ng CPY/m3. For rain, the greatest frequency (40%) was in the range 1 to 10 ng CPY/L. Concentrations of CPY in snow exhibited similar patterns, but with more concentrations in the range 0.01 to 0.1 ng CPY/L . Apart from the detections in plants in montane areas of California discussed in Mackay et al. , there are reports of detections of small concentrations from more remote areas, such as the panhandle of Alaska . Concentrations of CPY in lichen were < MDL (1 ng/g l. ms.) and mean concentrations as great as 2.4 ng/g l. ms. in needles of conifers in Denali National Park, Wrangell-St. Elias National Park and Preserve, Glacier Bay National Park, Katmai National Park and Preserve, the Stikine-LeConte Wilderness, and the Tongass National Forest in samples collected between 2002 and 2007. The amounts of CPY measured were small in comparison to those reported at locations closer to regions of release  and are not suggestive of the transport of toxicologically significant amounts of CPY. It is thus not surprising that small but detectable concentrations can be found in remote locations such as Svalbard ,. The largest concentration in a remote location was found in ice corresponding to the 1980s from Svalbard. While that concentration was 16 ng CPY/L, concentrations measured more recently are generally <1 ng CPY/L. Residues of CPY and CPYO were absent in the surface section of the core, representing 1990 to 1998 , despite this likely being the period of greatest global use. A survey of concentrations of CPY in a north-south transect of lakes in Canada reported the presence of residues of CPY . Greater concentrations were reported in lakes with agricultural inputs (mean =0.00065 μg/L). Concentrations and frequency of detection decreased with increasing latitude, with mean concentrations of 0.00082, <0.00002, and 0.00027 ?g/L for remote mid-latitude, subarctic, and arctic lakes, respectively. These were grab samples and the temporal profile of exposures are not known; however, all concentrations are several orders of magnitude less than the HC5 for crustaceans (0.034 μg/L, Table 3) or the NOAECeco of ≥0.1 μg/L (see the ‘Toxicity in aquatic meso- and microcosms section) for repeated exposures in microcosms. Chlorpyrifos (but not its toxicologically significant product of transformation, CPYO) has been detected in surface waters, particularly in areas of intensive use . In several regions of the USA, these concentrations have decreased since the late 1990s and early 2000s -, most probably as a result of changes in patterns of use . Thus, rather than an upward trend in concentrations, the frequency of detection and the concentrations measured in surface waters have declined. This is not indicative of persistence in the environment. While both CPY and CPYO are classified as "toxic", based on the assessment of persistence and bioaccumulation, all the lines of evidence suggest that neither would be classified as persistent or bioaccumulative under the SC or EC Regulation No. 1107/2009. Based on the analysis of LRT, neither CPY nor its most toxic transformation product, CPYO, would be transported at sufficiently great concentrations to cause adverse effects in humans or the environment in remote areas. Based on the simple criterion for toxicity in EC Regulation No. 1107/2009, CPY (and by extension, CPYO) would be classified as toxic; however, when a more refined assessment of ‘risk' is considered instead of ‘hazard,' it does not present unacceptable risks to humans or organisms in the environment. Based on the wording of the SC, CPY and CPYO do not present a significant adverse risk to humans and the environment. These conclusions are based on the selection of higher quality data but are similar to those reached by inclusion of all the data . The authors JPG, KRS, and DM contributed directly to the concepts, analyses, development of conclusions, and writing of the paper. JA provided technical assistance and assessment of the strength and relevance of the studies, and KRS formatted and prepared the paper for submission. All authors read and approved the final manuscript. Funding for this assessment was provided by Dow AgroSciences, LLP, USA. The opinions expressed in this paper are those of the authors alone. All of the references are available from publishers or from the authors except for those reports which are considered to contain confidential business information. These reports have been provided to the appropriate regulatory agencies for use in their reviews and deliberations relative to chlorpyrifos. If readers wish to obtain specific information contained in these reports, requests will be passed on to the registrant on a case-by-case basis. JPG was supported by the Canada Research Chairs Program, a Visiting Distinguished Professorship in the Department of Biology and Chemistry and State Key Laboratory in Marine Pollution, City University of Hong Kong, the 2012 ‘High Level Foreign Experts' (#GDW20123200120) program, funded by the State Administration of Foreign Experts Affairs, the P.R. China to Nanjing University, and the Einstein Professor Program of the Chinese Academy of Sciences.